The disaster at Aurora, Colorado reminds film scholars of the birth of their obsession, Lumière brothers’ Arrival of a Train at La Ciotat, where, as the story goes, the audience bolted out of the theater at the sight of the train pulling into the station. A character coming out from behind the screen and opening fire seems like a dark prophesy realized, a medium’s natural development. However, Dark Knight Rises, is not the only movie where we see bodies fall like rain, and while it fits the plot more than a movie like Ted, it yet remains unclear—and probably will remain so— why the killer chose this over hundreds of other feature fests of violence. There is nothing that makes Batman particularly different from other similar movies where the hero saves the day just before the whole planet, or America, is blown to pieces. Nor is the antagonist much more inspiring to identify with as he looks more like a failed proto-Darth Raider. But the move provides one of those instances that simultaneously represent the limits of structuralism, and the power of myth (the former’ watering hole). While the movie clearly lacks structural cohesion, yet an obsolete form propels the drama where all inconsistencies lose relevant while remain intact. For the cynical viewer, (who watches the movie from the meta-position of being way beyond the spectacle, but just watching it to get entertained by watching the culture watching it), the discrepancies invite chuckles—admittedly this movie has the plot consistency of an alphabet soup, but yet it is shocking how the myth of Batman congeals the soup and keeps the projector running. What is yet more significant is how both the protagonist and the antagonist are masked and both are for the most part incomprehensible. One waits for the hero’s inspiring words, or his nemesis’ provocative ones, but instead hears them mumbling as if through an out of tune transistor radio. There is a gag of language, which is put into their mouths by the myth that mutes the words, while making them interchangeable, replaceable, both soaking in and drying them of meaning. It is only the gestures—the communication of communicability in words of Agamben —that carries the film, and are these gestures what drives the cinematic form, not the words, and not the human faces behind the masked creatures. The muteness of the characters presents a kind of verbal confusion that is necessary to maintain mythic positions a place beyond words, “the gesture is essentially always a gesture of not being able to figure something out in language.” But at times, this verbal muteness might translate from words to rounds of ammunition. This by no means is to submit to one of those simulacrum theories of reality’s submission to image and such, rather, it is a question of manifestations of formal possibilities. Drive is a shell of a movie, a film emptied from content, a set of cinematic conventions gathered around a story line (the plot description seems redundant, obviously its on Wikipedia). The protagonist is a toothpick chewing stuntman, a part-time mechanic and a night-time getaway driver. There is romance, violence and car chase. The location; Los Angeles, a city as a movie set; the leading role; a stuntman, a stand-in for the main actor; and the movie itself, all follow the same logic and yet the movie is more than mere cinematic formalism. Rather, it shows how this formalism generates content, and while the film itself tip toes around it, one gets invested in the movie, aware of the highly stylized imagery on the screen. It is a ride on a moving walkway while looking outside through a glass wall. It is the cinematic experience of a display window. The cast, the streets, the emotions, the roles, all work as props, they are elements that point to conventions. Mirror + face + blood + shut gun + masks + make-up table. In Notes on Gesture, Agamben writes “[a] finality without means is just as much of an aberration as a mediation that makes sense only in relation to an end… Gesture is the display of mediation, the making visible of a means as such. The movie, reduces all elements to pure gesture, in all equivalence they come on the screen and do their little dance and go back to the wings. Some return and some don’t. In the youtube video Child taping what remains of his house, we see a boy filming a pile of rubble which used to be a house. It is of course difficult to confirm if the house belongs to the child and his family, but nevertheless, that is what the title suggests. The man who is filming the child first approaches him as a news reporter approaches a subject of interview in a war zone, and as he gets closer he apparently asks: can you tell me what you see? Which also could be read as “can you tell me what you are filming?” The child responds to the question and other questions posed by the man. Both of them are clearly acting a scenario and the footage also implies a spoof on official/traditional television reportage (they even laugh at some point to a joke that the child makes). 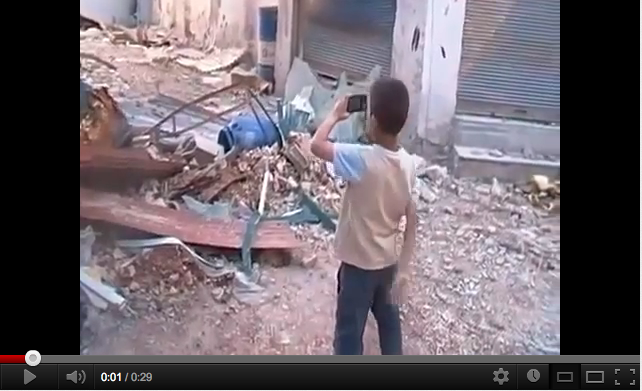 The same video a few years ago would show the child in front of the rubble talking to the camera, now both the child and the other camera are filming. The child delegates the task of experiencing the destruction of his house to the camera, similar to a tourist in front of an ancient a ruin. He does not want to be the represented, but rather the one who represents. Here, in the words of Adorno, one can witness the triumph of representation over what is represented. Not unlike the journalist, the child is also interested in dissecting the site of destruction with a camera, to describe what he can see and highlight the economy of access, but this time to his own rubble. Friedrich Kittler mentions a 1902 German Reich law that gave every man and woman the “right to one’s own image,” here the camera gives the child the right to his own rubble. This gives rise to a new figure of victim, one that is detached from his own destruction by a digital camera. A victim who removes himself from the ruin and whose “rejection of experience can provisionally embody a legitimate defense,” in words of Agamben. A generation that grew up looking at monitors from the point of view of first-person shooter games can now experience its own habitat as the game zone.